On March 31, 2014, James Hewitt Smith, a loving and loved husband, father and brother passed away peacefully at ninety-one years of age. He was at home with his immediate family by his side. He was born May 10, 1922 in Elyria, Ohio to Edward Reuter Smith and Alice Kelly Smith. He was third in a family of seven children. The full life led by Jim is difficult to recount in a few paragraphs. He was a loving husband, father and brother who cared for his family until his last day on earth. He survived the Great Depression working with his father on construction projects that included bridges and roadways of the Appalachian Highway. The stories, while sometimes harrowing, were nonetheless laced with humor. Jim enrolled at Cornell University in Ithaca, New York in 1941 just prior to the start of World War II. Jim immediately enlisted in the Army in 1942. He transferred to the Marine Corps in 1943 and graduated from Boot Camp at Parris Island. He attended Marine Corps Officer Candidates School, Quantico, Virginia. He spent most of his Corps career assigned to Camp Pendleton where he rose to the rank of Lieutenant. As a Tank Officer he trained men to fight in the Pacific and would most likely have been part of an assault on mainland Japan had President, Harry Truman not made the difficult decision concerning the Manhattan Project-the dropping of the atomic bomb on Japan. He was discharged in 1946. His sons often expressed relief he was not part of an assault on Tokyo as they may not have otherwise entered this world. After WW II, Jim returned to Cornell University where he attained one of the first degrees awarded in Industrial Labor Relations, in 1948. He maintained contact with Cornell Alumnae and the campus until his last days with us. As a product of the Great Depression and Marine Corps esprit de corps he put himself through college and simultaneously paid off his parent’s mortgage. Jim’s business career began with Mesta Machine, in Pittsburg, PA. As a kid amongst men, he quickly gained the trust of all the men pouring steel in the foundry to management. 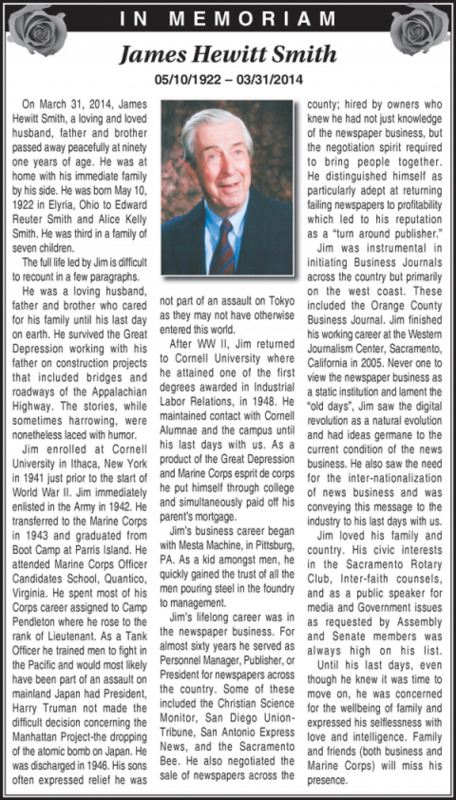 Jim was instrumental in initiating Business Journals across the country but primarily on the west coast. These included the Orange County Business Journal. Jim finished his working career at the Western Journalism Center, Sacramento, California in 2005. Never one to view the newspaper business as a static institution and lament the “old days”, Jim saw the digital revolution as a natural evolution and had ideas germane to the current condition of the news business. He also saw the need for the inter-nationalization of news business and was conveying this message to the industry to his last days with us. Jim loved his family and country. His civic interests in the Sacramento Rotary Club, Inter-faith counsels, and as a public speaker for media and Government issues as requested by Assembly and Senate members was always high on his list. Until his last days, even though he knew it was time to move on, he was concerned for the wellbeing of family and expressed his selflessness with love and intelligence. Family and friends (both business and Marine Corps) will miss his presence.